Americans gazed upwards in their millions on Monday, as a total solar eclipse swept the country. It was the first such eclipse to go from the west to east coasts of the US in 99 years. From schoolchildren in Missouri to mounted patrol officers in Idaho, the nation was transfixed by the sight of the Moon drifting in front of the Sun, and blocking its light. Far from the crowds on Earth, just six people saw the umbra, or the Moon's shadow, from space. International Space Station (ISS) astronauts had a clear view as they orbited above the US from an altitude of 250 miles (402km). They crossed the path of the eclipse three times. Meanwhile the BBC's James Cook had a front-row seat as he chased the Moon's shadow at 40,000ft. Warnings had been made about eye safety in the build-up to the eclipse, with people told they should not look at the Sun directly with the naked eye, and instead wear special protective eyewear. Most people appeared to heed this advice, though what some placed over their eyes may not have done much to protect them. In Haiti's capital, Port-au-Prince, where the solar eclipse was partially visible, this man made glasses from a plastic bottle. While in Havana, Cuba, a street performer took his chances. Others chose to project the eclipse, instead of trying to view it directly. But Andrew, a dog belonging to a BBC News reader in Nashville, Tennessee, was well-equipped for sky-gazing. In the town of Greenville, South Carolina, one set of parents made a last-minute decision to name their daughter, born hours earlier, in honour of the eclipse that cast a spell over their country. Eclipse Alizabeth Eubanks weighed six pounds and three ounces, according to Greenville Memorial Hospital. 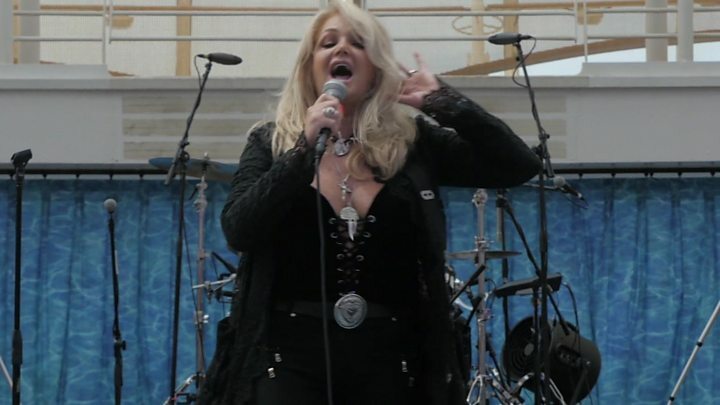 The singer Bonnie Tyler helped mark the moment aboard a cruise ship as it sailed through the path of totality. Despite being decades old, the song cruised straight to the top of the iTunes charts. A different style of celebration took place at the Symbiosis Oregon Eclipse Festival in the Ochoco National Forest. Free spirits there raised their hands to the skies. All the while, ISS astronauts "photobombed" the solar eclipse - as this composite image shows. Finally, here are some of the most breathtaking photos of the solar eclipse, if you weren't lucky enough to see it with your own eyes.